Before going into details about AltUnityTester, I want to tell you a bit about my own context and the struggles I’ve had in mobile games automation. A few years ago, I started working on a few projects with Bitbar developing automated scripts for mobile game companies. Most of these companies were looking to get fast feedback on their games by running basic checks on many different devices using Testdroid Cloud. Most of them were also interested in running checks on both iOS and Android and they mostly wanted to see that the game starts, loads correctly and in a reasonable amount of time on as many devices as possible. Some companies were also looking into adding tests to verify the first steps of the game, finishing the first few levels, navigating through the main menus or trying out the most important features. Appium seemed like the best choice for this, since it offers great interaction with the device on both iOS and Android, supports many programming languages (so each company could choose their favorite) and is a favorite of many testers that are familiar with UI Automation in general, as it’s similar to Selenium WebDriver. 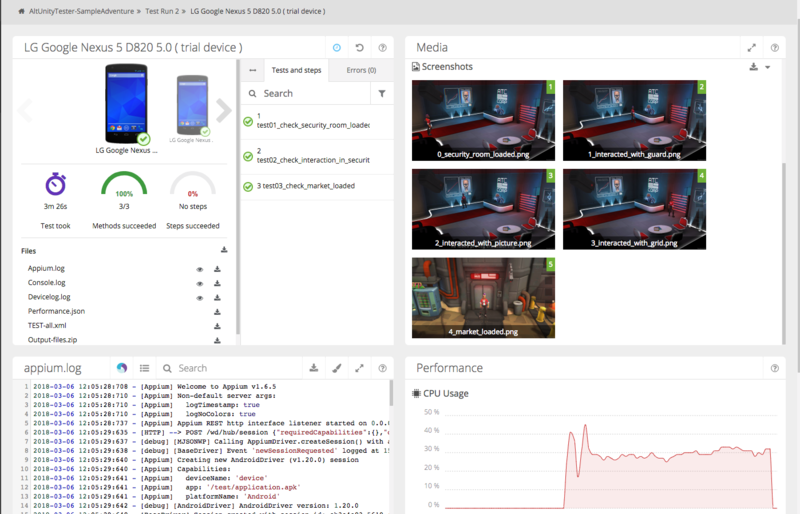 But, for games developed using game engines like Unity or Unreal, that don’t use the native UI frameworks, Appium couldn’t detect any of the objects on the game. Clicking at specific coordinates was not an option considering the device fragmentation problem that most companies were trying to solve and the diversity of resolutions available out there (Here is a presentation I did at ETC 2016 about our approach). We decided to use image recognition to detect “objects” (pictures) on the screen. We had a lot of success with that, but, as expected, image recognition is slow and this approach was not suitable for games like endless runners or games where reaction time is essential. A couple of yeas after that, I started working with a different company as a tester/app developer in their New Concepts team. We were trying out a lot of new ideas, developing small apps and prototyping a lot of solutions in a very fast paced environment. Along with new ideas, we also needed to try new graphical designs and we needed to create apps that were fast to develop and could be deployed to a multitude of platforms if needed. We focused mostly on iOS and Android, but we needed to know that the apps could run on Windows, Mac, etc. After trying out a few options, including some web frameworks, we decided to develop all our apps in Unity. It has support for any platform that we could ever need and it’s excellent for fast prototyping, with incredible graphics on every platform and with an abundance of ready-made artworks, scripts, plugins and solution available on their Asset Store. While Unity allowed us to be very productive on the development side, I was again struggling on the testing side. I had to deal with a lot of apps that still required a lot of testing. Most of these apps also had to work together as part of a system, and we often found ourselves trying to figure out ways to deploy and run some automated checks on our environment automatically. 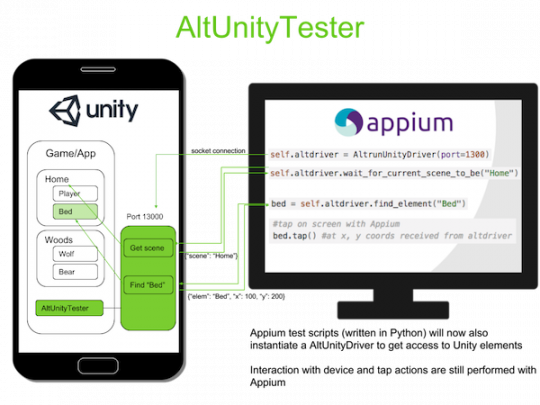 While the apps were relatively simple and would have been the perfect candidate for simple automated checks with Appium (which works on Android, iOS and even Windows nowadays), Unity didn’t have a solution for running these types of system level / UI driven tests on real devices. While searching for a solution for these two problems, Rasmus Selsmark, a fellow tester who works at Unity in Helsinki, told me about this hack-day project that provides one possible option for running Appium tests against Unity games and getting feedback from Unity about the objects on the screen via the Debug.Log() functionality – so essentially by injecting information about specific objects in the device logs (logcat on Android or syslog on iOS), from where they can then be parsed and used inside the Appium tests. I tried it out and then decided to try to implement something similar using a TCP socket running from the Unity game that can listen to commands sent from the tests. And so AltUnityTester came to be. If you’d like to know more about AltUnityTester or about any of the aspects covered in this blog post, leave a comment, we’d love to hear from you! Interesting blog. I have looked at using BDD for automating games in the past. Even thought of coming up with a new development approach GDD Gaming driven development somehow using gherkin syntax. Thanks! GDD – interesting idea. Did you already have some thoughts on how to make it specific to games? This is exactly what i needed. I have been working in automating games test developed in Unity through image recognition. I started to do some stuff with the logs to find elements positions, and thinking of other ways to get unity elements. This will help me so much! That’s great to hear! If you need any help or run into any problems, please let me know, we’ll try to help! Is there any way to use it on apps developed with older version of Unity? I’ll send you an email and maybe we can connect on Skype to discuss this further. Is Java/C# binding is in the roadmap? Yes, both are on the roadmap. Java will be straightforward to implement with Appium, so we are thinking of doing that next. The C# + Appium combination is not the easiest, so for C# we are actually thinking of just implementing something using the Unity Test framework and without Appium. That will mean we could run the tests on any platform, from the Unity Editor. Java will be a great addition! Can’t wait to try it. Why is C# problematic? .NET core build should work also on other OS, not only on Windows. We are just about to release a new version of AltUnityTester that also has support for C# tests. Based on Unity Test Framework or python like client but written in C#? It will be similar to Unity Test Framework, using NUnit and with Unity Editor support. Hopefully we’ll have it out later today, I’ll send another message if we do. I’ve been trying out the sample which works great on Android and now have a few questions. Should it work or are there plans to get this to work with Windows (ideally both classic and UWP)? I’ve tried using the sample with windows classic and the only issue I find is it dislikes the “tap” method. The c# solution you mention will use the Unity Test Framework, I assume that limits it to editor time testing only? Would like to know how to access Game Objects when we have canvas based screens/games. The only option using Appium is doing screen comparison and that to has drawbacks with different resolutions. Hi! AltUnityTester helps with exactly that! You can access game objects via Appium because we expose those using a socket connection. You need to instrument the game to allow the socket to be opened, but after that you can search for objects via AltUnityTester, get their coordinates and click/interact with them using Appium. Hi, I’m new to automated testing (and by no means an engineer), but I have got this solution working now on Windows 10 🙂 This looks very promising! Does every game object need to have a unique name or can I select objects through their parents or hierarchy? Buttons usually do have unique names, but the text objects beneath them do not. And Ok or Cancel buttons have generic names, but are unique within a screen or panel. Secondly, can I combine altunitydriver with other drivers? My game uses native keyboard to enter player name for instance. So I would like to use the send_keys command for this. Yes, you should be able to combine AltUnityTester with other drivers. The example Python script from here: https://gitlab.com/altom/altunitytester/blob/master/Assets/AltUnityTester/ExamplesAndTests%20(can%20be%20deleted)/sampletest.py shows that you will basically have 2 different drivers: “altdriver” is the AltUnityDriver for finding elements/game objects from Unity, and “driver” is you usual Appium driver that you can use to interact with the device as you would normally. I hope this helps! Let us know if you have more questions. Hi, I’m looking for AltUnity for Windows sing Selenium Java.. Is it available? At the moment, we only have bindings written in Python. We are thinking of also adding Java, we just haven’t had the time to do that yet.. The Python bindings do work on Windows, so maybe that would be an option? Maybe I did not set up Appium correctly. It sounds like the command to install the python module didn’t work properly. Can you try re-running it? Does it only work on mobile game? I’m trying to use AltUnity for a WebGl game that I want to test on a browser. For now, AltUnityTester only work on mobile, but we are hoping to expand support to other platforms too in the future! Thank you for this blog article, that was really interesting! We also want to create automated tests for our application, and are currently looking for the best solution to do that. Until now, we only tested Airtest Project that seems pretty awesome! Did you know this solution? Thanks! We are just about to release a new version that has support for a lot more features, so stay tuned! 🙂 I didn’t know of Airtest, I will check it out soon. First, thank you for this great solution. It is very similar to AltomUnityTester, but does not work with Appium and therefore I’m no sure if it would work also on test farms. It’s limited to Unity3D input, but has great support of query language (XPath like). Thanks! Airtest looks interesting, but it uses image recognition, we’ve tried that as well but with problems when you have your tests running on different devices + different resolutions. Unium looks really interesting! Thanks for sharing these, we’ll have a closer look at both! Yes, it looks like Airtest uses image recognition, but poco works exactly as AltUnityTester and I think, you can mix both of them together (I’ve tried only poco). Ah I’ll check it out! The https://gitlab.com/altom/altunitytester repository already has the latest version, the Unity Asset Store package is under review. is it possible to integrate your tool with Katalon? I didn’t know about Katalon before, I just googled it now. It seems interesting, we will have a look and see if we can use it! At the moment though, AltUnityTester doesn’t work with it. I’m also interested in the possibility of integrating Katalon Studio and AltUnityTester! I recently learned about the application and would love to use it for UnityApps. Regarding Katalon, we don’t yet have any plans to support it, we’ll try to keep you updated here if that changes and we have a more clear plan in that direction. So this can no longer be used with Python? Looking in the source history, looks like this was all removed a month ago. Hi, AltUnityTester does not require a specific Unity Version. We didn’t have this problem before so can you please write an issue about this error at https://gitlab.com/altom/altunitytester/issues for further disscusion. Please mention what version of Unity and what version of AltUnityTester(0.2.3, 1.2.0 or 1.2.2) are you using. Also please include an screenshot with console where the error is shown. Hi Ru, thanks for AltUnity Tester. I was tried using in my game project, but I have a doubt ’cause in your Python example do you used desired.caps to set up and device configuration. But when I make the same test in C# I don’t know how to configure the capabilities of my project. I tried import Selenium Web Driver but don’t work. Ru, thanks for your support!!! Can you post a short video tutorial for it? We have this in our roadmap, but just haven’t had the time for it yet… Hopefully we will have it ready soon! Can we test VR apps as well using it? We haven’t actually tried it, but we think you should be able to test VR apps on mobile just like you would any other game. As long as you can interact with the app in mobile mode, then it should work. If you give it a try, please let us know if it worked! 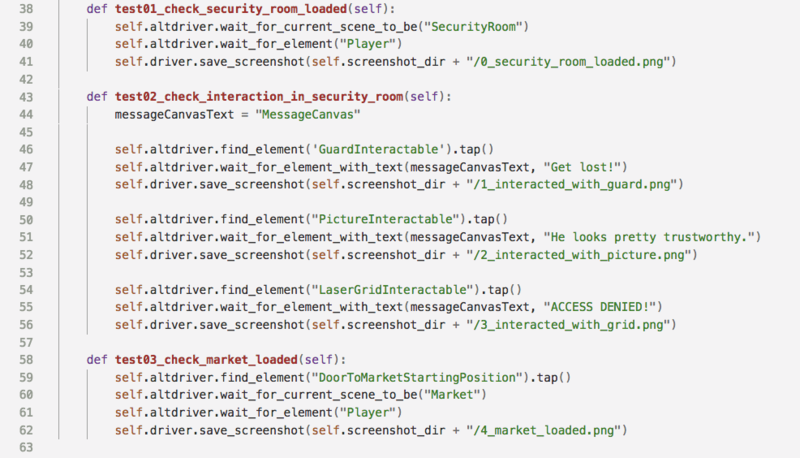 Hi, is possible simulate python script for iOS and Android on running game in Unity editor? That allows polish script in quick time and then make real test on devices. Yes, with the latest version of AltUnityTester, you can run the game in Editor and try out the Python scripts against it. Any hint or link how to do? If you import the latest package (1.3.0) in Unity Editor and open the AltUnityTester window, you have a “Play in Editor” button. When the game in playing in editor, you can run your Python scripts against it on port 13000 locally. I tested it in editor and on device. Looks really nice. Good work. If I run it in editor and my python script crash on some error, I cant connect again to the same already running server and must stop and run game in Unity editor again. Yeah, that’s a good point, we’ll have to fix that!